Horleys Huge provides all the nutrients necessary to put you into anabolic overdrive, by creating the optimal environment for growth (anabolism). 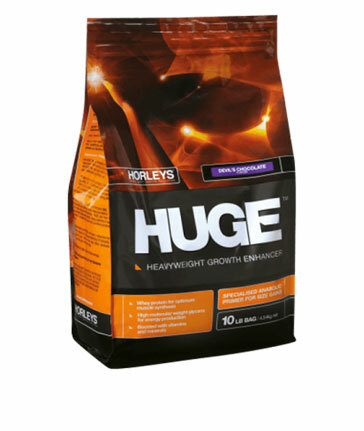 Providing 26g of quality protein per serve along with rapid absorbing and sustained relealse carbohydrates, Horleys Huge is a heavyweight growth enhancer. Whey Protein Concentrate contains a full spectrum of whey peptides and is naturally high in BCAA’ and growth factors to stimulate protein synthesis and improve recovery. The fast release carbs provide a sustained energy source whilst the high GI carbohydrates will trigger an insulin response and the release of the anabolic hormone insulin which drives the nutrients into the muscle tissue at a rapid rate for maximum muscle gains. Horleys Huge is ideal for “hard gainers” who struggle to put on size and maintain weight, those with fast metabolisms or physically demanding jobs, through to the experienced bodybuilder. Horleys Huge provides a calorie dense mass gainer with absorbable amounts of protein and synergistic ingredients to ensure quality muscle mass gains. Add 3 heaped scoops (approx. 120g) to 300ml of water or 360ml of milk or fruit juice. Mix well. Huge has been designed to take up to 3 times per day. Take a serve (or half serve) between meals, ideally mid morning, mid afternoon and one serving about 1 hour prior to bedtime. 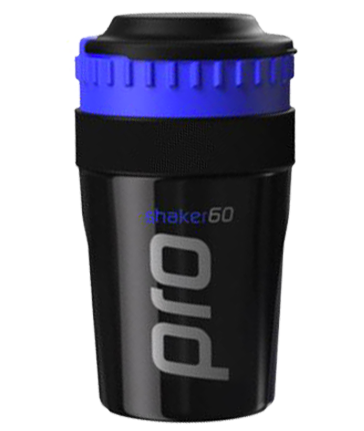 If you only take 1 serve per day it shoul be immediately post-workout. INGREDIENTS: Carbohdyrate Matrix (Maize Maltodextrin, Palatinose (Isomaltulose), Soluble Fibre), Protein Matrix (Ultrafiltered Whey Protein Concentrate, Milk Protein Powder), flavours, Thickeners (415, 412), Vitamins & Minerals (Magnesium Oxide, Magnesium Phosphate, Vitamin C, Zinc Sulphate, Niacin, Vitamin E, Ferrous Furmarate, Vitamin A (ß Carotene + Vitamin A Acetate), Vitamin B1, Vitamin B2, Folic Acid, Potassium Iodide, Vitamin D, Vitamin B6), Sweetener (955 - Sucralose).